Dr. Andrew B. Jordan (it’s pronounced “JER-dan”) is a dentist with multiple years of experience and extensive training in the area of general dental practice. As an expert dentist on the Emergency Dentists USA team, he helps us make sure that we are partnering with qualified dentists across the country, helps verify the accuracy of all the information on our EDUSA Dental Blog, and makes sure we’re recommending patients to dentists who are offering the most up-to-date care available. Dr. Jordan is a native of Beulaville, North Carolina. He received a BS in Business Administration from East Carolina University. Following this, Dr. Jordan also received his Doctor of Dental Medicine (DDM) degree from the East Carolina University School of Dental Medicine, where he served as class president for four years. As a student, Dr. Jordan was a member of DMD (the ECU School of Dental Medicine service fraternity) and volunteered at North Carolina Missions of Mercy dental clinics. As an Emergency Dentist USA Dentist, Dr. Jordan will quality check articles for up-to-date, evidence-based, and factually accurate information. If there is a new procedure that our patients need to be aware of, Dr. Jordan will pass that information on to us in an educational and easy to read fashion. And he’ll make sure that we’re only partnering with dentists and oral surgeons who are highly qualified and ready to provide the best possible care to our readers and those who call the EDUSA helpline. Dr. Jordan is currently a partner in private practice at the office of Drs. Hardee & Jordan in Greenville, NC. 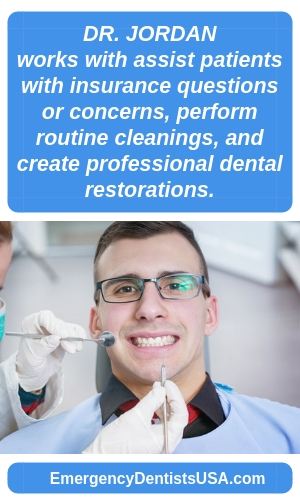 At this practice, he and the rest of the team he works with assist patients with insurance questions or concerns, perform routine cleanings, and create professional dental restorations. Dr. Jordan is also a member of the North Carolina Dental Society, the American Dental Association, and the Academy of General Dentistry. Dr. Jordan and his wife, Catherine, welcomed their first child in 2015, and a second in 2017. The Jordans enjoy spending time at the beach, being with family and friends, and cheering on the ECU Pirates.